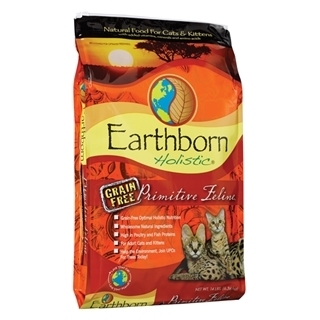 Earthborn Holistic Primitive Feline Natural Grain Free Cat Food provides your cat with high quality sources of protein including both poultry and fish. This grain-free formula features natural antioxidants, and vitamins and minerals to support the immune system. Quality animal and fish proteins help build and maintain lean muscle mass, keeping them strong and active. Additionally, the balanced levels of phosphorus and calcium promote strong bones and teeth. This cat food offers optimum nutrition for both kittens and cats.